Dove | Scuffalong: Genealogy. Dove – Scuffalong: Genealogy. Confederate Citizens File: Durant Dove. An action for seducing away two colored boys. John Jones v. James Mills, 13 NC 540 (1830). Jones sued Mills in Jones County Court for “seducing” two apprentices from him. Jones produced evidence of his indentures of the boys, and Mills countered with proof that Jones had not properly executed bond, as required by law, not to remove the apprentices out of the county. The trial judge charged the jury that Jones had indentured the boys and taken care of them, and Mills, a stranger, “could not avail himself of any irregularity or defect in the bond” as a defense to the suit. The jury returned a verdict for Mills, and Jones appealed. The North Carolina Supreme Court overturned the decision, opining that, even if the bond were defective, the apprentices had not been turned loose, “fit subjects to be seduced and employed by any stranger that thinks proper to interfere. Durant and Willis Henderson — alias Dove? I knew that my Hendersons originated in Onslow. I also had a good friend during my college years who was a Dove. A bit of research quickly established that L.D. was a descendant of Durant Dove, via his son Lewis James Dove. Further research, still ongoing, strongly suggests that Durant and Willis’ mother, Nancy Henderson alias Dove, was the sister of my great-great-great-great-great-grandmother, Patsey Henderson. Their father appears to have been Simon Dove, a free man of color from Craven County. The case file also reveals that John Jones bound Durant and Willis in 1819 to serve as his apprentices and learn the art of farming. They remained with Jones until 1828, when Mills took them into Jones County, giving rise to this suit. The case for Nancy Henderson and Patsey Henderson as sisters is circumstantial, but strongly suggestive. (3) Nancy’s children (Durant, Willis, Miranda, Patsey, Gatsey, Minerva, William and Betsey) and Patsey’s children (James and Bryant) were roughly the same age and were occasionally apprenticed together. (4) Several names recur among the grandchildren of both women. Nancy’s son Durant Dove (alias Henderson) had children named Lewis James, Julia, Susan, Eliza, Edward and Nancy. Patsey’s son James Henderson had children named James, Lewis, Susan, Julia, Edward and Nancy. Durant reared his family in Onslow and Lenoir Counties NC. James reared his in Onslow and Sampson. James left Onslow in the 1850s. Despite the physical distance and probable lack of contact, both men drew from the same pool of names for children born well into the 1870s. 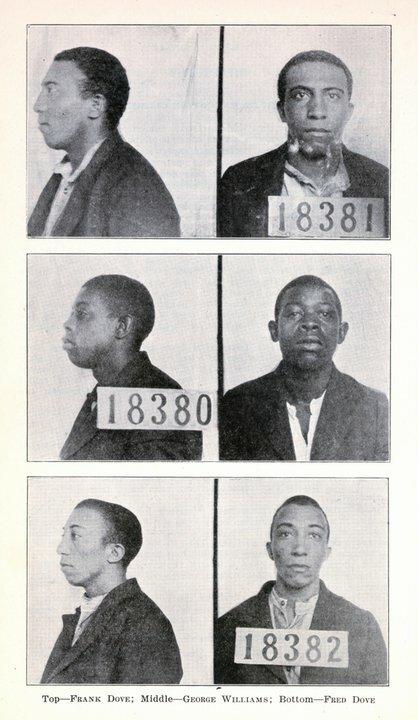 These men were convicted of the August 1922 murder of mail carrier Cyrus Jones in Swansboro, NC, largely on the testimony of another man, Willie Hardison, who was tried separately for the murder. Hardison later confessed that he had made up their involvement under the threat of being lynched. The state electrocuted Hardison in 1923, but both the trial judge and the prosecutor wrote letters requesting executive clemency for George Williams and the brothers Frank and Fred Dove. After almost six years on death row, the three were given full pardons in March 1928 by Governor A.W. McLean. Sidenote: My people are from Onslow County, just west of Swansboro. My furthest traceable Henderson ancestor was a free woman of color named Patsey Henderson, born about 1800. Patsey’s sister Nancy married (or perhaps didn’t) a free man named Simon Dove. The Onslow County Doves, including Fred and Frank, are descended from their son Durant Henderson, alias Durant Dove. Image from “Capital Punishment in North Carolina,” Special Bulletin from the North Carolina State Board of Charities and Public Welfare, Raleigh, N.C. (1929). Copy courtesy of the North Carolina Collection, Wilson Library, University of North Carolina at Chapel Hill.